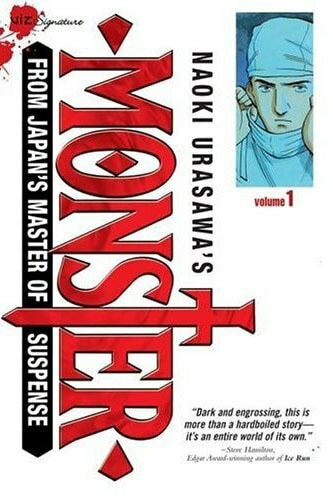 This is the first volume of many in Naoki Urasawa’s Monster series. I’m not going to say too much about it as I don’t feel qualified to critically appraise Manga. I read it while asking myself what it has to contribute to the argument that graphic fiction could be a source for health professionals. I guess I’m used to reading gritty social realism in art comics and so I found this a bit… simplistic? Its certainly enjoyable: our altruistic hero, the young talented surgeon Kenzo Tenma, is cast against a background of corrupt, power hungry hospital doctors. After being briefly tempted by the the rewards of the system, he is persecuted for sticking to his morals. The illustration is wonderful and the story exciting, although it tends toward filmic fantasy. The idiomatic language seems slightly odd to my western ears (eyes) , as I guess one would expect from a japanese person telling a story in English. To my mind the characters seem a little sterotyped: the beautiful, fickle directors daughter to whom Tenma is engaged is full of ambitions of being a surgical director wife, but dumps him when he falls out of favour and is no longer the revered hot shot. Its a tale of heroic male doctors and fawning, pretty female nurses or dismissive, ugly ones. As Scott McCloud points out, however, comics tend to work through creating stereotypes and that is one rhetorical device that gives them their power. Like Black Jack stories such as this, although not accurate in a “realistic” sense, still provide emotional truths and work, I think, as a form of allegory, providing a role model that might well influence the way that doctors work or encourage medically oriented carrer choices. I will have to read more of this prodigeous series, sometimes one must read on before making ones mind up, I guess volume 1 is just the introduction. watch this space. You got it all wrong! The first volume was only the very very begginning, The plot later develops and the issues surrounding the environments and experiences of children that can devlop into personality disorders is more focused upon. Alcholism also shows up quiet a bit. From the first volume you’d think that the plot was centred on the roles of hospital directors and such. However, this theme is overshadowed by the recurrent debate of who doctors should treat; that you can’t tell if a person’s soul is evil or not when in a hospital and how all lives are equal or not, in other words: should doctors choose who to treat? It’s a brilliant read. Not to mention I was pretty hooked on it for an entire week. But definilty not simplistic.